Voicing - Not happy with the tone of your Piano? Does it sound too harsh or too dull? Is the tone un-even across the octaves? Consider having your piano voiced. 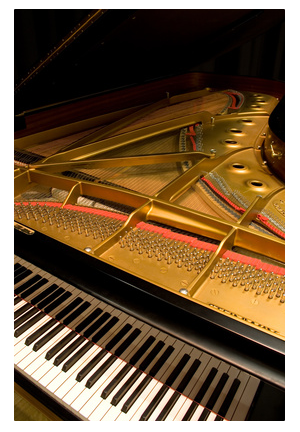 The best time to determine whether or not your piano should be voiced would be during your next tuning appointment. A finely tuned piano will reveal whether or not voicing will satisfy your tone preference. Repairs and Regulation - Includes Repairing action parts, damper parts, missing or broken strings, addressing any related issues. We can also regulate your piano’s action, dampers and damper pedals to specification. This will allow your piano to function at the optimal level which will greatly improve the response, touch and feel of your instrument. Restoration - This service takes regulating and tuning to the next level. We would clean the entire piano, restore the entire action, keys, key bed, key frame, pedals, strings, felts, hammer felts and more. This will also include touching up the finish and providing a final regulation plus tuning. Rebuilding - Want to know if it’s worth rebuilding your piano? Give us a call for a free initial consultation. From replacing the pin-block, sound board, strings, hammers, action parts, key tops, to re-finishing the case and all hardware. Piano Realm stands ready to deliver what your piano needs. Consulting - Looking to Purchase the Right Piano? Let us help you make an informed decision. Are you thinking about getting a free piano from a relative or neighbor? Before spending time, energy and money getting the piano moved into your home, consider having us asses the value and condition of the piano first. We also provide estimates for resale value and insurance purposes. You can order piano accessories from us at great prices such as Piano lamps, stools, benches, key covers, piano covers, caster cups and much more. Catalogs are available upon request. Please don’t hesitate to contact us for additional information related to any of the services we provide. Thank you in advance!